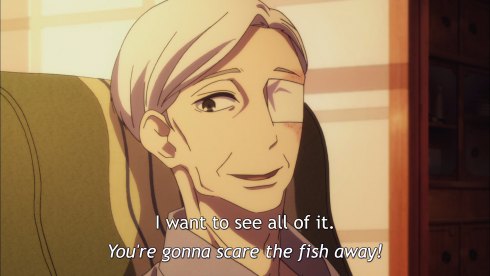 Every week I think Rakugo Shinju can’t possibly get any better, and every week Rakugo Shinju shouts “CHALLENGE ACCEPTED!” and proves me wrong. 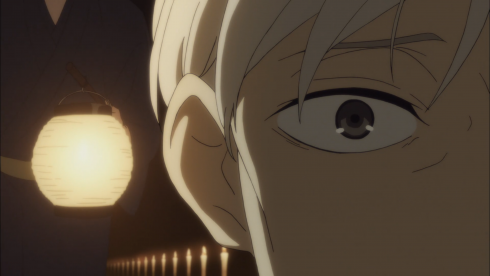 After last episode’s harrowing confrontation, we’re offered a reprieve of sorts, as everyone does their best to move on from the tragedy of the ruined theatre and Yakumo tries to turn last week’s realization into action, no longer seeking death but instead reaching out to the lives around him. 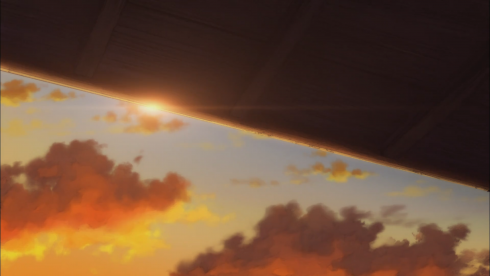 It leads to a quietly, deeply emotional climax and capstone to my favorite relationship in the series, promising hope for the future–right before it drops us into another potential pit. This show will be the death of me. But man, what a way to go. 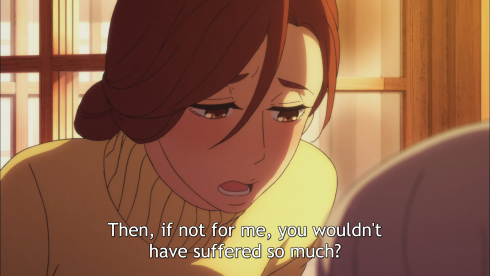 As you can probably tell from that last jumbled paragraph, it’s a difficult thought to put into words, which is why Rakugo Shinju wisely embedded it into the visuals and narrative instead. 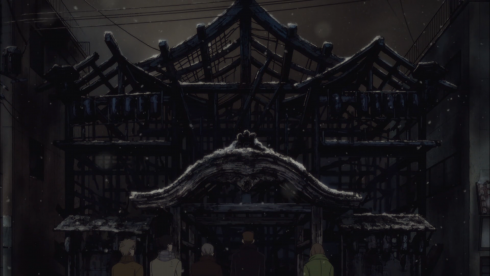 We begin with a burned-out theatre in the middle of winter, shift to spring and Konatsu announcing her pregnancy, and then finish with three generations watching a flurry of cherry blossoms amidst a deepening sunset. The episode fluctuates like a wave between images of birth and death, until finally combining them so that they become one and the same, beginnings and endings coexisting, both an integral part of the story and of the characters’ lives. Hope amidst wreckage and loss amidst healing. This “tone of simultaneity” also speaks to Yakumo’s own changing mindset, as he no longer seeks to push away either the past or the present but instead embraces both, speaking of Miyokichi and Sukeroku not as vengeful ghosts, but as the people who “gave color to my dreary life.” He still misses them dearly (“those two, whom I can never reach”), but he doesn’t seem to dread them the way he sometimes did before. Similarly, while he’s still a little snarky with Konatsu (and vice versa), it’s an affectionate combativeness, more like the way they acted around each other before the accident. 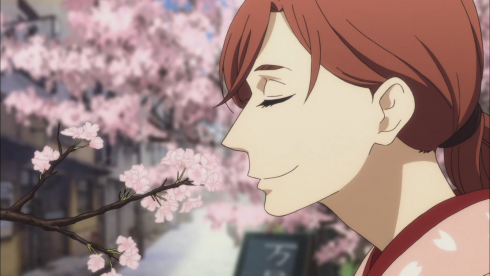 He also genuinely enjoys Yotaro’s rakugo and encourages Shin’s flower confetti, smiling openly, happily, for the first time in…er, well, a really dang long time. 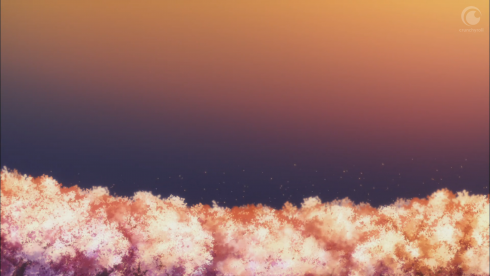 Yakumo wants to see the cherry blossoms and sit in the sunset’s glow, and most importantly, he’s finally able to express those wishes to others. But no, Yakumo assures her. She may be the reason he had “no time to die,” but she’s also the reason he “had no time for regrets,” either. It’s not that she forced him to stay alive, but that she was the reason he was able to keep living at all. In many ways, Konatsu saved his life just as much as he saved hers. As sad as it is that they were both too grief-stricken and withdrawn–perpetually curled up, hedgehog-like, to prevent someone else from hurting them again–to admit how much they cared about each other until this moment, it’s still a beautiful, poignant moment, and proof of a love that’s been building steadily pretty much since Kikuhiko watched a little girl perform rakugo, all those years ago. 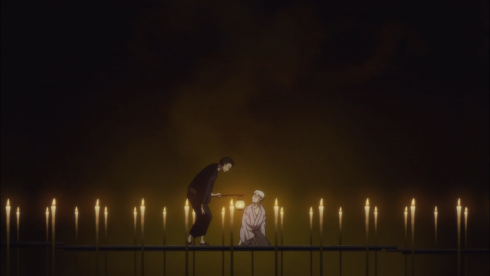 And as if that weren’t enough, Konatsu’s “Thank you for raising me instead of abandoning me” echoes all the way back to the second episode, to a lonely geisha’s son sobbing in a bathhouse because he realizes he’s been abandoned by his own family, and we remember how much Yakumo has done to make sure Konatsu and Yotaro never had to feel that way, and…ah… ‘scuse me, I have a little something in my eye. 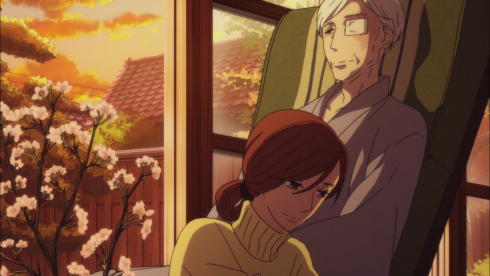 In many ways, our lovely sunset patio scene is intended to echo and evoke those happy days from last season’s Episode 11–cherry blossoms in bloom, a dual performance of “Nozarashi,” a quiet moment of intimacy on a porch with a comb in hand–as if Yakumo and Konatsu are almost able to return to a time before all their shared hurt and grief. There are key differences, of course: Konatsu’s the one fixing Yakumo’s hair this time, the cherry blossoms have to be imported, and Sukeroku is of course absent, replaced by his two quasi-heirs (Yotaro and Shin). These differences assure us once more that we can’t return to the past, not entirely. Even so, Konatsu and Yakumo can capture a new feeling that’s mighty similar to an old one, and perhaps stronger, given how much they’ve grown and been through together at this point. 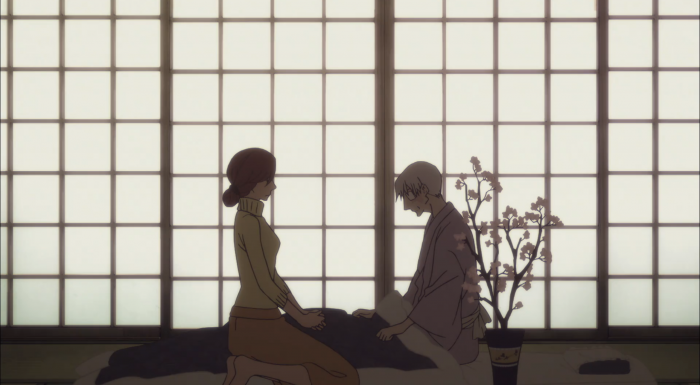 Even better, where their last idyllic afternoon on a porch involved Yakumo telling Konatsu he wouldn’t want a girl to perform rakugo, here he laughs at her shyness and immediately accepts her as his apprentice. Even in a scene so strongly reminiscent of the past, our repetition comes with variation yet again. Change is inevitable–and in this case, it’s downright triumphant. All of these echoes–all of these supposedly contradictory ideas merging together into such a peaceful, happy moment–help to prepare us emotionally for our sudden final scene. 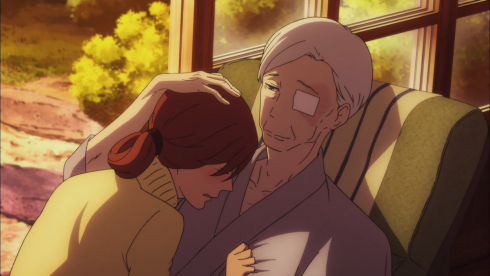 In the world of Rakugo Shinju, life and death walk together much like masters and students do. “Kindred spirits,” as Yotaro says. 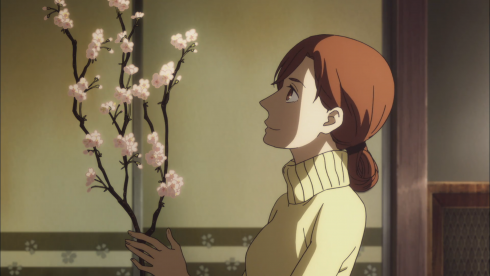 And those cherry blossoms may be beautiful, but they’re also fleeting. So I can’t say I was surprised when Yakumo suddenly found himself in “The Land of the Dead.” I can’t say I’m upset about it either. Emotional, yes, but not upset. And as much as I’d like Yakumo to get another reprieve, I’ll also be…satisfied, I suppose?…if this really is his final journey on that candlelit road. Narratively speaking, it’s an appropriate moment for it. 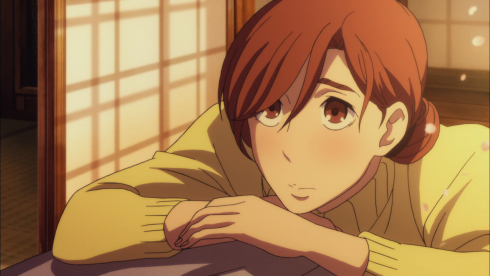 He and Konatsu have made peace with each other, and Konatsu has received his blessing to perform rakugo. Yotaro was able to save Yakumo’s life last week similar to how Yakumo once saved his. He and Shin shared a pair of smiles that warmed my heart so much you could’ve toasted marshmallows on it. 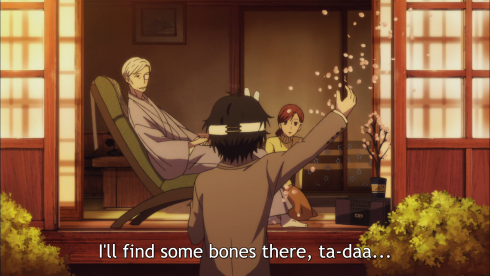 While there are things Yakumo may wish he had time to do, there are few things in this world he still needs to do. 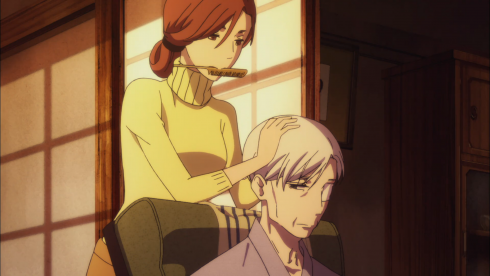 Just the opposite, in fact: he may need to pass on in order for the next generation to be able to grow, both as adults and as the bearers of the rakugo torch. Yotaro won’t perform new pieces while Yakumo’s alive, after all. Change, even the beneficial kind, often requires loss. We may have reached a point where that’s the case here, too. We know Yotaro, Konatsu, and Shin will be all right. 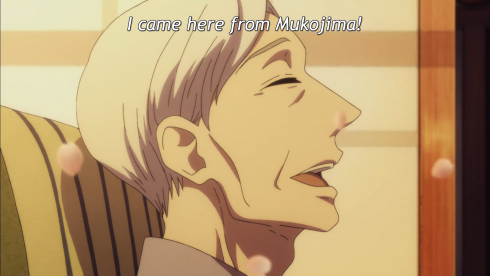 Rakugo will be, too. And Yakumo’s journey still isn’t over, not yet. 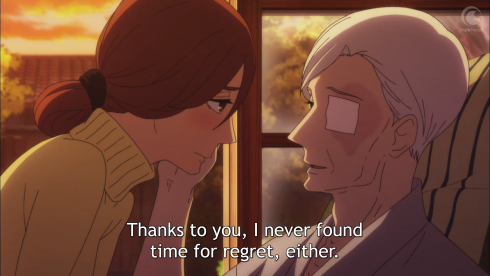 He may have reconciled with the present, but I don’t think he’s forgiven himself for his past mistakes, nor fully come to terms with his own feelings–about his life, his lost friends, and rakugo itself. I’m not sure these are things he can address in the land of the living. Here in the darkness, with his dearest friend at his side to help light the way, he faces what may very well be his final journey. Will it lead to peace or more heartache? Either way, I should probably invest in a fresh box of tissues, just to be safe. WELP, Li’l Bon and Li’l Shin did the voiceover for the Episode Preview. Next week is going to destroy me, isn’t it? Another subtle change to the opening theme! The candle at the very end was out and then came back to life. That’s a very promising sign for our story at large, I’d say. A Theory: As I mentioned last week, each time Miyokichi’s “ghost” has appeared, Konatsu has been involved in the performance–and last week she was even crying, as if she could see what we saw. This week, Konatsu says she thinks Yakumo’s afraid of “Miyokichi coming to kill him,” but he says she’s mistaken and instead speaks fondly of Miyokichi. Is it possible that our visions of Miyokichi have been from Konatsu’s perspective? Is she projecting her feelings onto the stage in an attempt to understand her mother, and maybe Yakumo, too? Food for thought, at least. I couldn’t quite work this into the main text above, but there’s a lovely focus in the cinematography on mundane beauty and everyday magic–lots of quiet scenes of people living their lives and sharing in one another’s company–all with Yotaro’s performance playing in the background. 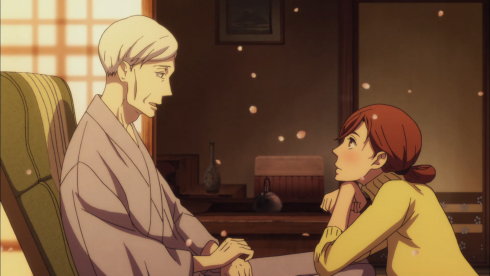 There’s a fascinating interplay this week between humanity and storytelling, as Yotaro puts his relationships with others–his love–over his career, and Yakumo’s time away from the stage allows him to “notice things besides rakugo.” There are some things in life more important than rakugo, and yet it’s those very “incomprehensible feelings” that rakugo so successfully captures, depicting the humor, the beauty, and the magic of the everyday world. Reality and fiction weaving together, indistinguishable. Simultaneity. 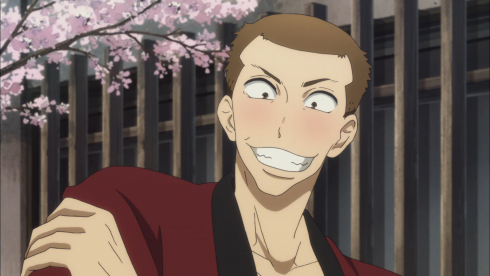 This Week in Rakugo: “Nozarashi” again–the first rakugo story young Yakumo/Bon heard (performed by Sukeroku/Shin), and perhaps the last one he’ll hear, too. Yakumo is also once again “the bones,” as he was when he played the resurrected women during the two-man “Nozarashi” performance. Interestingly, “Nozarashi” is a story as steeped in death and impermanence as “Shinigami,” but with a much lighter, humorous outlook and tone. Maybe that bodes well for our protagonist, too.